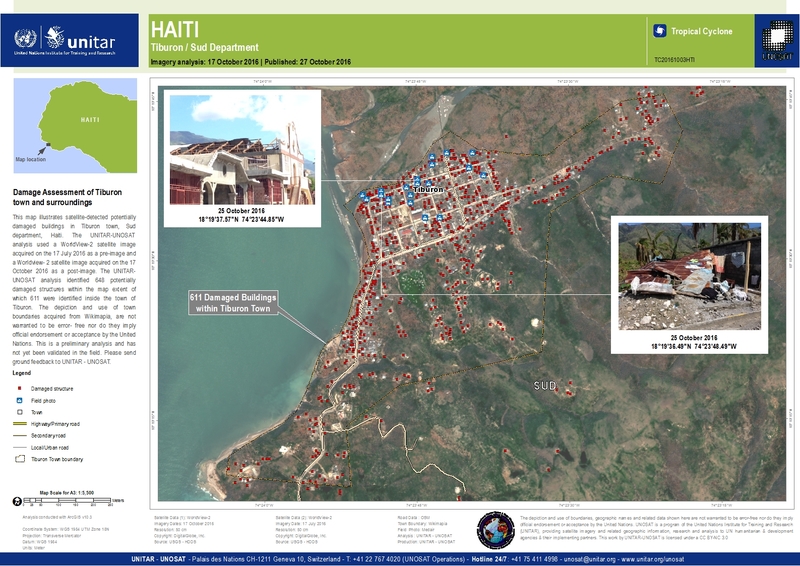 This map illustrates satellite-detected potentially damaged buildings in Tiburon town, Sud department, Haiti. The UNITAR-UNOSAT analysis used a WorldView-2 satellite image acquired on the 17 July 2016 as a pre-image and a Worldview- 2 satellite image acquired on the 17 October 2016 as a post-image. The UNITAR-UNOSAT analysis identified 648 potentially damaged structures within the map extent of which 611 were identified inside the town of Tiburon. The depiction and use of town boundaries acquired from Wikimapia, are not warranted to be error- free nor do they imply official endorsement or acceptance by the United Nations. This is a preliminary analysis and has not yet been validated in the field. Please send ground feedback to UNITAR - UNOSAT.